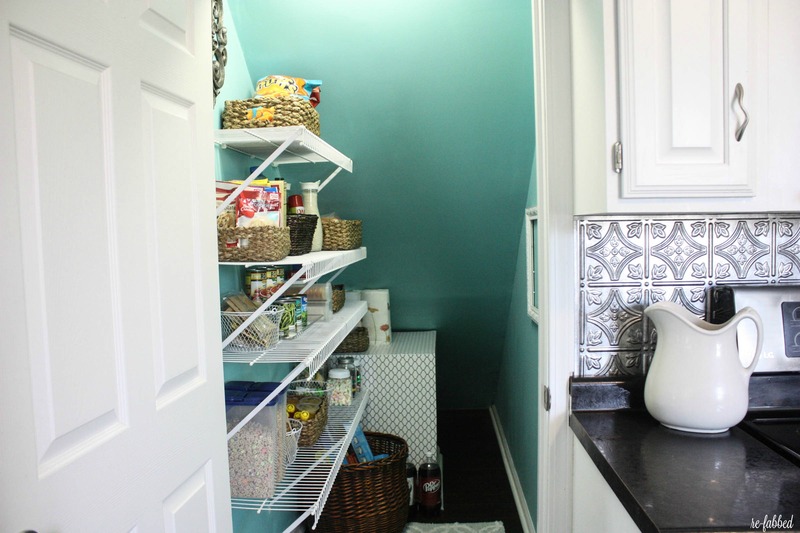 Who would have ever thought that a tiny little ole pantry would almost be the death of me? HA. I say that jokingly, but I am a little bit serious too! For months, I have watched this tiny room becoming an anxiety attack waiting to happen, but instead of tackling it, I just kept shutting the door. I literally could not move in there, nor could I find anything. It was flat out embarrassing, so I kept the door shut so that nobody ever had to see what was going on in there. I prided myself in a kept house, yet I couldn’t even find my own bread. How pitiful. Here is the photo I submitted for my “Disaster Zone”! 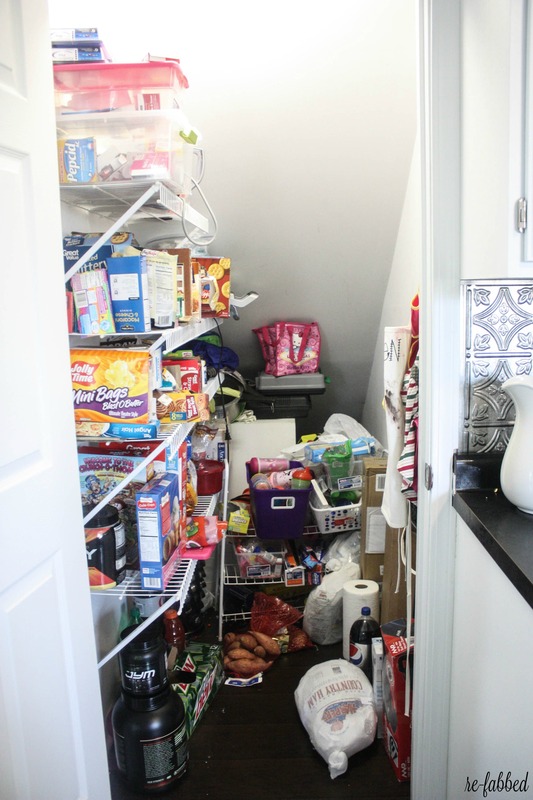 When I received my detailed advice from the marvelous Maeve Richmond, founder and coach of Maeve’s Method, she was very honest about the state of my pantry. She called it a “catch all”, and she nailed that. I was using it as a catch all, and I had lost complete control. She told me that this room was working way too hard, and it was very important for me to set a clear intention for the room. She mentioned that I have tons of cabinet space in the kitchen, and she went on to say that perhaps I should utilize some of the space better for some of these items. Great idea, Maeve! 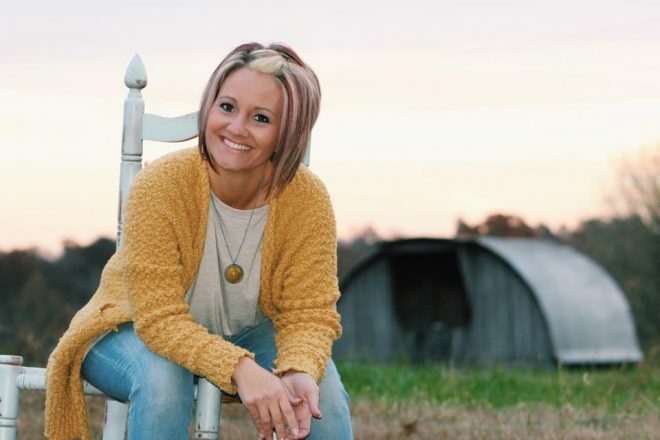 She also said to completely take everything out of the pantry, one shelf at a time, in order to evaluate what I have and what goes with what. She put it like this- “Like Things Live Together.” She said to ask yourself the story of each item on the shelf in order to find the purpose of that specific item. By doing that, it is easier to figure out why you have each item and where it needs to be. This process took a little time, but I went through and got everything out and accounted for. Here is my blank slate! And here is my behind the scenes dining room! It pretty much looks like mass chaos, but there was some method to this madness, believe it or not! One tip that Maeve gave me as a “freebie” was actually something I had always meant to do, but just never got around to doing. She mentioned painting the pantry, or at least a portion of it, in the same blue as my kitchen. This was the perfect time to get this done, so I went for it. 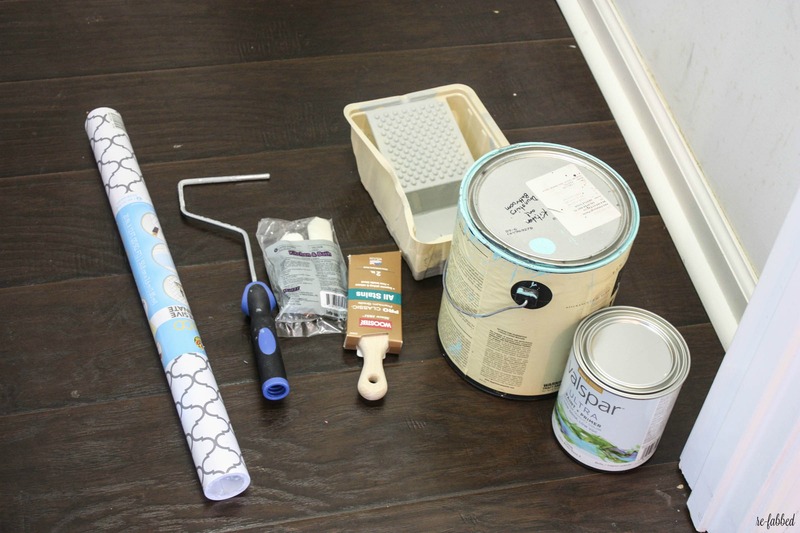 I had just enough left over paint to paint the entire room. Man, it changed the look big time! Another thing I decided to do was use laminate adhesive to cover the return air box. While I could have just painted it, I thought it would be cute to have a little extra design all of its own. This is the first time I have ever used this, and I really recommend it. It was very easy to use, and I still had quite a bit to spare. I got it at Walmart for around $5.00, so it is reasonable too! I love how the blue brightens this room up! By the way, the color is Valspar Gentle Wave. It is an awesome color. After 1 more coat throughout, Brandon hung the shelves back on so that I could get to the fun part, putting everything back together! 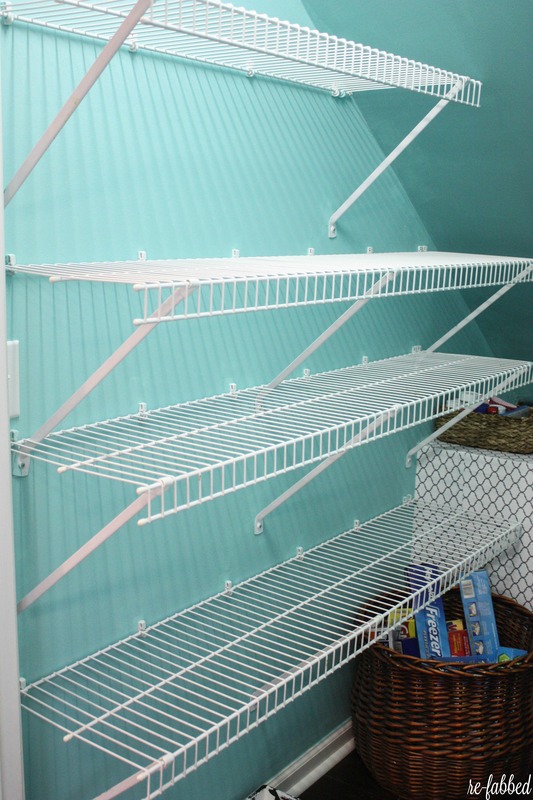 When it came to putting everything back into the pantry, Maeve stressed the importance of dedicated shelving. While she said there are good rules of thumb for where to put certain items, she also said that it is ultimately my space and needs to function for me, so to trust my gut. I liked that advice because that is so true. While some systems of placement work great for some people, it may not work for everyone, so we need to do what fits our own lifestyle best. For me, I honestly don’t keep a ton of pantry items on hand. I KNOW that is hard to imagine after seeing that first picture, but in reality, I truly don’t. 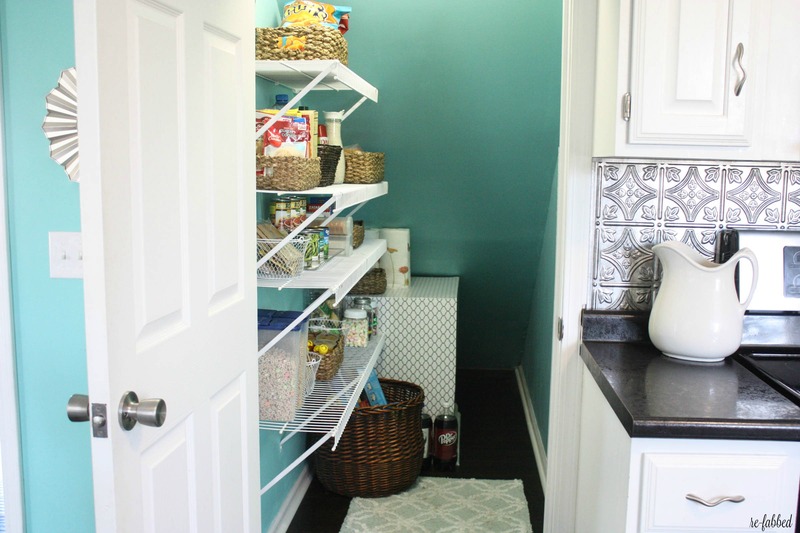 I don’t buy a lot of food in advance, and I do have other storage areas in my kitchen for most of my canned goods or certain boxed items, so the pantry is more an area for me that acts as a convenience room. 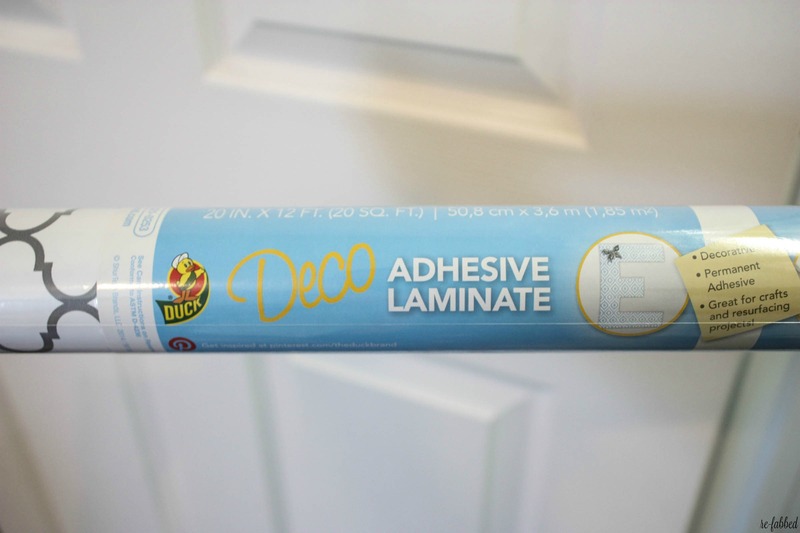 In saying that, I mean that I want the items that we use the most often to be readily accessible. I want the kid’s snacks, cereals, breads, etc to be easy to get to because those are the items that we use the most. Other “easy” foods also end up in here for easy access as well, because it functions well for us that way. Maeve also mentioned how helpful trays are in organizing your foods. By doing this, she said it would have a big impact on how I would perceive my space. 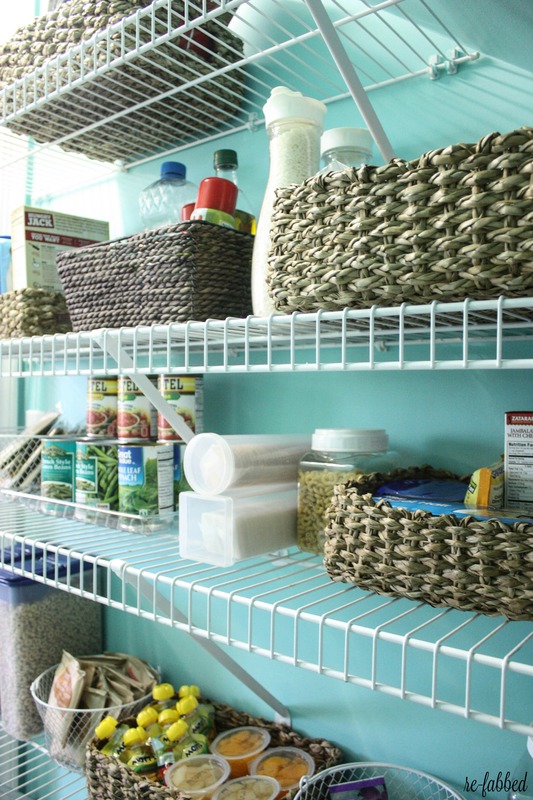 With each tray being a “zone”, it divides the shelves so that things can stay better organized. I loved this idea, because, like Maeve, I love trays. I did have 1 problem when it came time for me to implement this part of the plan. Because of time constraints, I was unable to find any trays locally that fit into my price range for this project. Had I been able to start on this project as soon as I received word that I was chosen, I would have had a little extra time to order some, but I couldn’t start right then, and time was getting away from me. While I totally understood what she meant by creating a “zone”, I decided to use baskets that I found on clearance from TJ Maxx instead. These baskets would still create the same effect as the trays, and I could move them around just as easily. I also found several clear containers from Dollar Tree and Walmart to use on my shelves to keep from having so many distracting boxes. After careful consideration of what should be re-introduced to my new and improved pantry, this is the end result! As you can see, the space looks completely different! 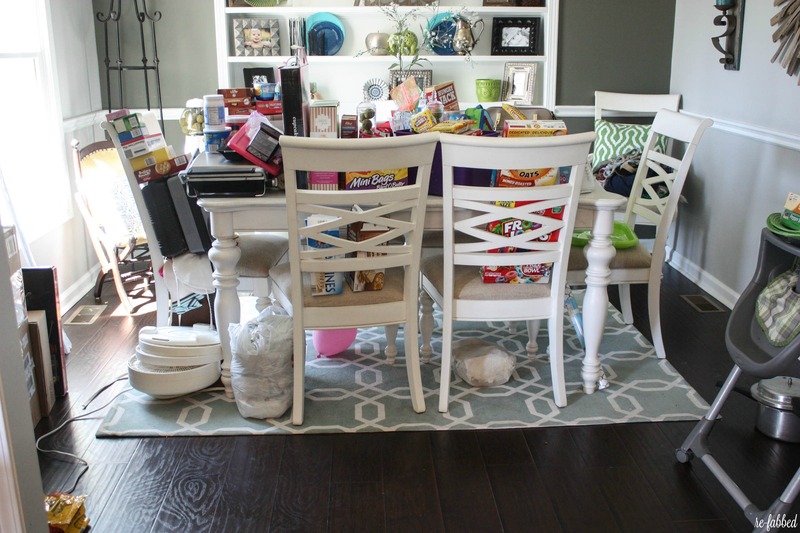 And what is so insane to me is that EVERY bit of the food items are in this room! I did away with all of the random items that did not belong and only brought in what did. 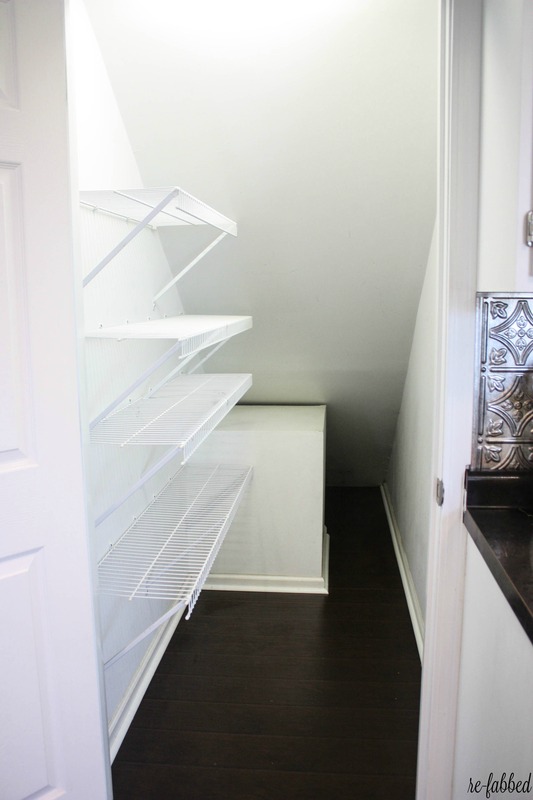 By doing this, the space was so much better utilized and is full of only the items that I will be needing. I put the cereals and kids snacks on the bottom shelf so that they are easily accessible for the kiddos. As much as I try to keep them out, there is no way that is going to happen, so I might as well keep them from climbing the shelves! 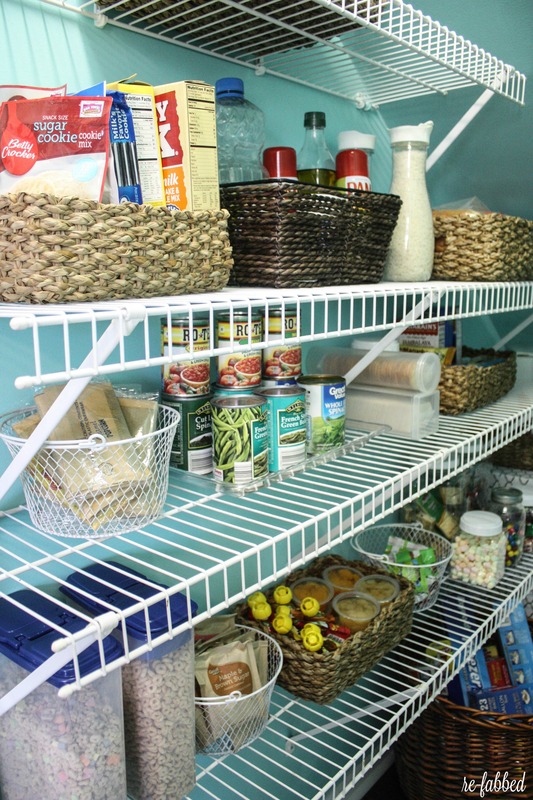 I really liked using a tray for the canned goods, because they tend to get lopsided on the wire shelving, and this keeps them nice and straight…and together. It cracks me up to look at this picture because of my vast variety of canned goodness! 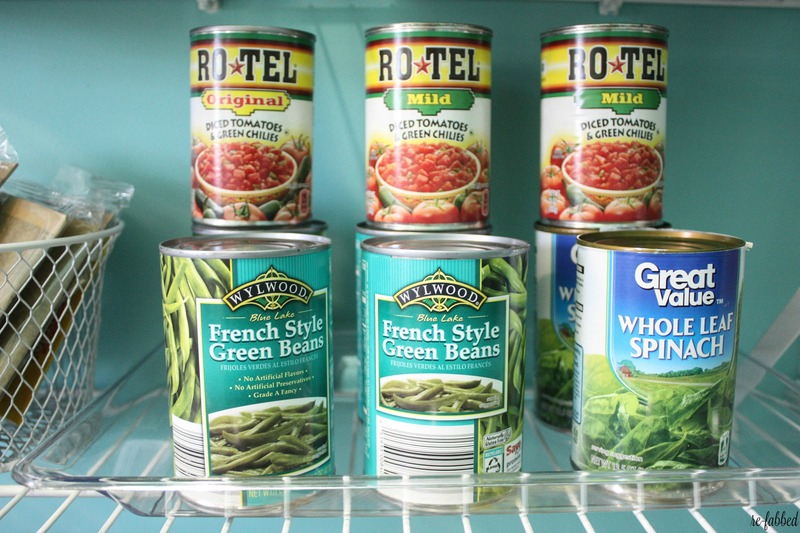 Spinach, green beans and rotel= the pantry of champions! 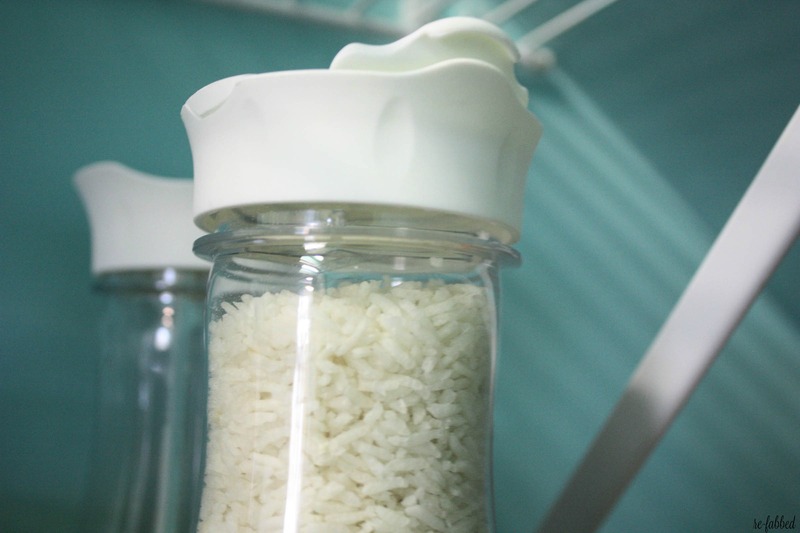 I took the rice out of the boxes and combined them into these nifty containers with spouts. This makes dispensing that much easier. They were at the Dollar Tree, and I loved them. And here is the other wall! 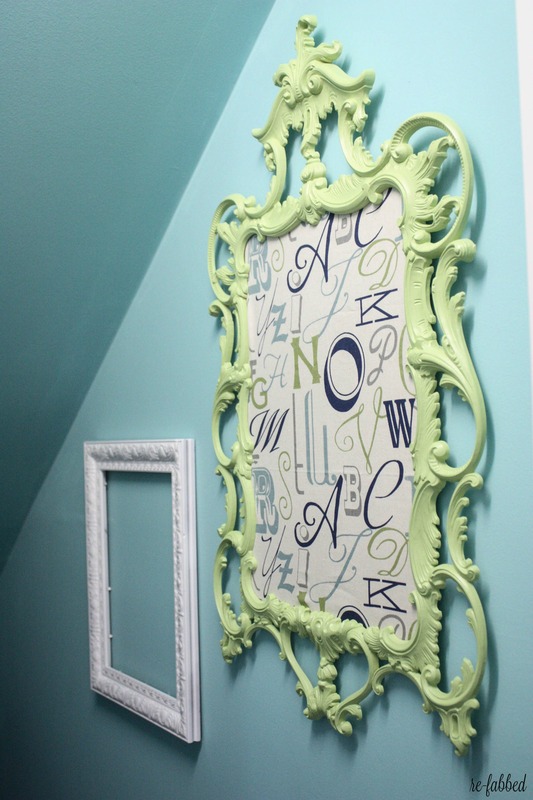 I will tell you about this awesome green wall hanging sometime soon, maybe. It is completely different than when I got ahold of it. It really fits in perfectly in my new space! As you can see, I did away with the small wire shelf that I had in front of the return air. It was broken, and it was honestly just in the way. After searching and cleaning out other areas of my home, I was able to find better spots for all of the other items that I had thrown on it, and it has went on to a better place. 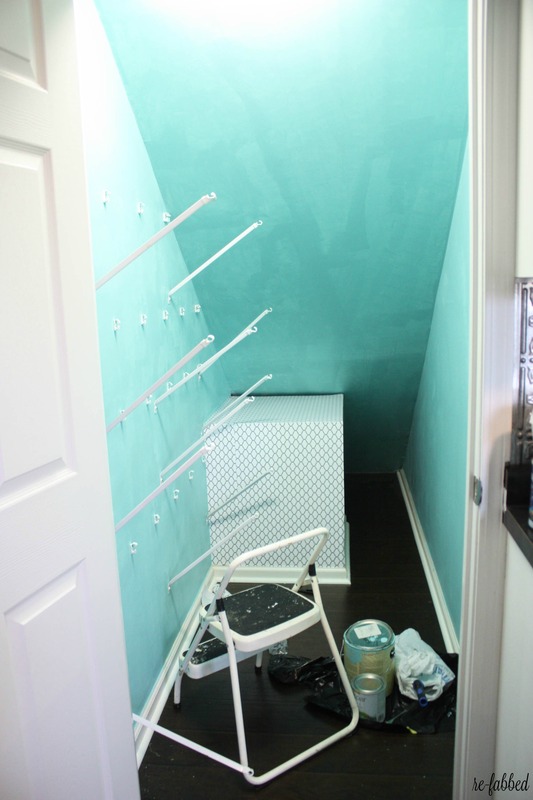 While this makeover was more work that I think I even anticipated, the end result is SO worth every minute. I can finally open the door and feel proud, and more than that- find what I am looking for! What a relief. The anxiety is gone, and it makes me want to tackle some of those other “problem” areas! 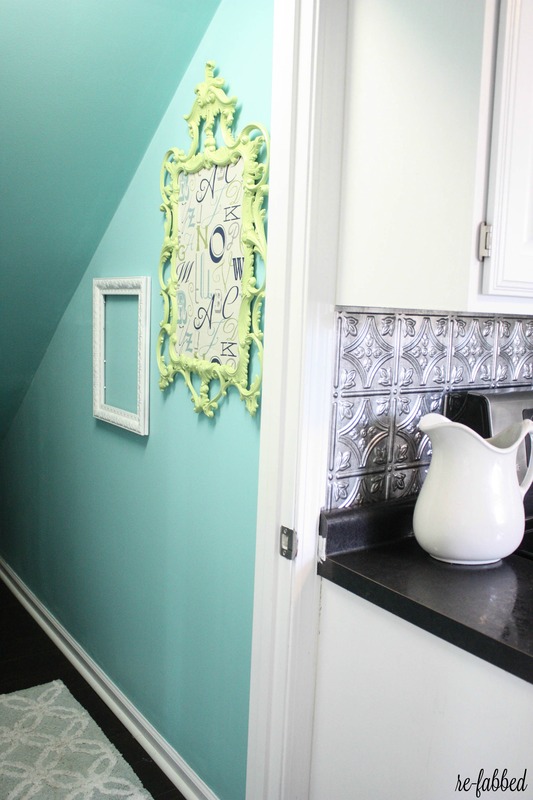 Maeve was amazing to work with, and her detailed ideas for my space were a life saver. She really knows her stuff, and I am thrilled that she took the time to hone in on my specific space in the way that she did. She literally left nothing out! Thank you again, Maeve! Categorize! Place items that go together, together! Use less boxes! This is HUGE for me. 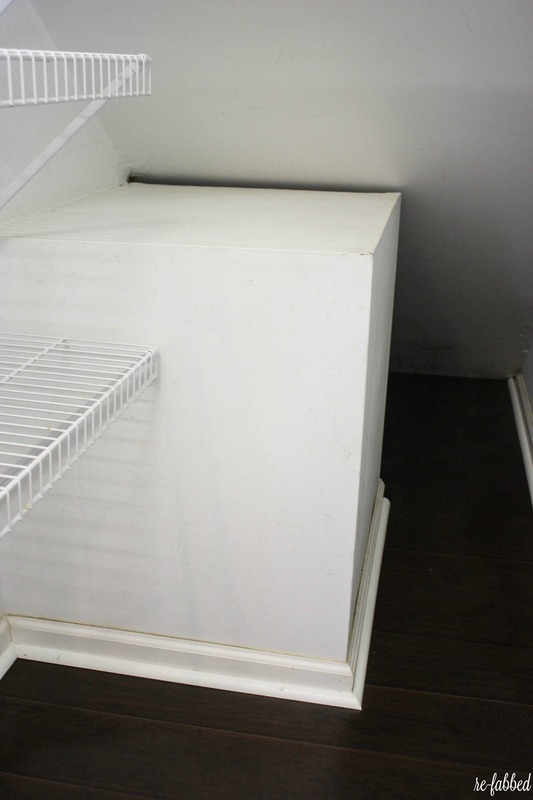 The fewer boxes you use, the less cluttered and bulky the space looks. It is so much easier to see what I have now that it is in clear containers. Just be sure that you don’t buy too much in bulk or the expiration dates can get away from you. Make it functional. Sure, it is cute to have all of the labels. They make great pinterest pictures and inspiration, but for me- they weren’t functional. I knew I could never stick to those categories, so I decided to forego that route. Do what makes sense for you. Make a system that makes it easier on your life. My pantry is not your traditional pantry, but it doesn’t have to be. It needs to have the items that I need, easily accessible for when I need them…and it does that. Wow, Brooke, it looks amazing!! 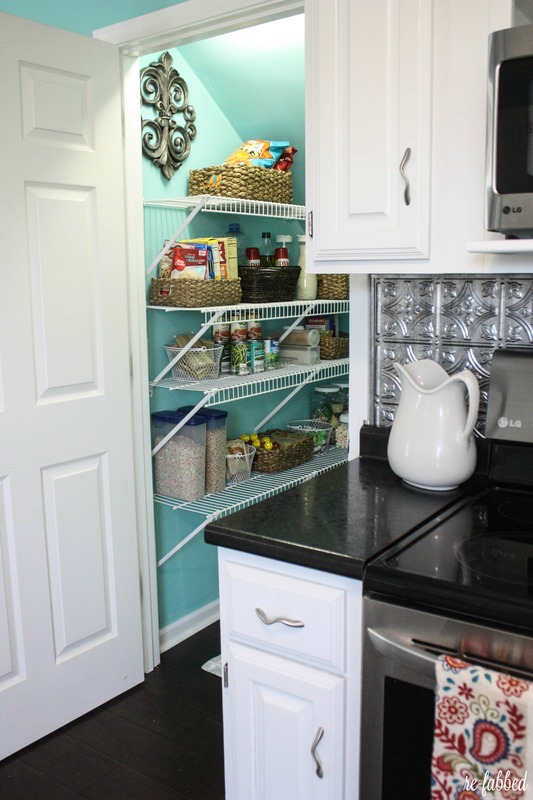 Love that your pantry is now functional for your family AND gorgeous! Good job girl! Thank you SO MUCH, Kimm!! THAT is the challenge 🙂 Thank you! Thank you, Glenna! I can’t imagine it being worse than mine was. I can’t even tell you what all I found in there! HA! Brooke it looks so good! Love the wall hangings by the way 🙂 I really like that you painted the walls. You are right, that makes a huge difference and feels like an extension of the kitchen! Great job! Awesome job!! Very inspiring to get mine completed. 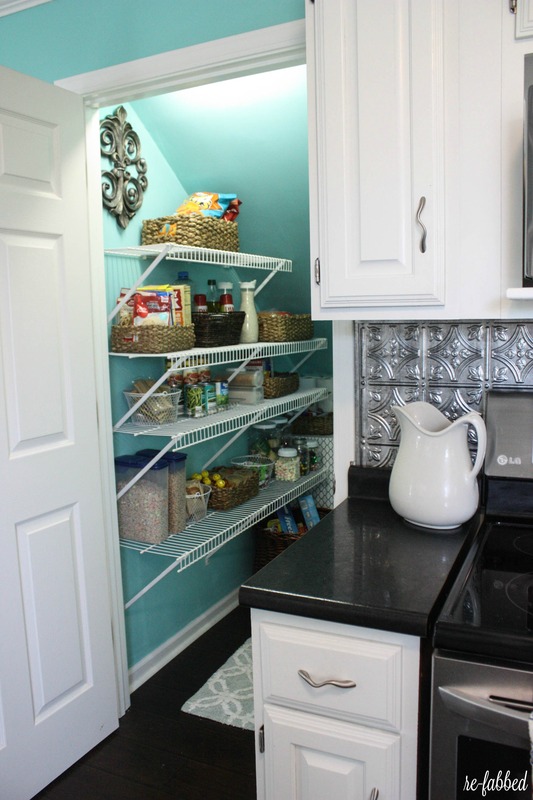 Love your new pantry!!! 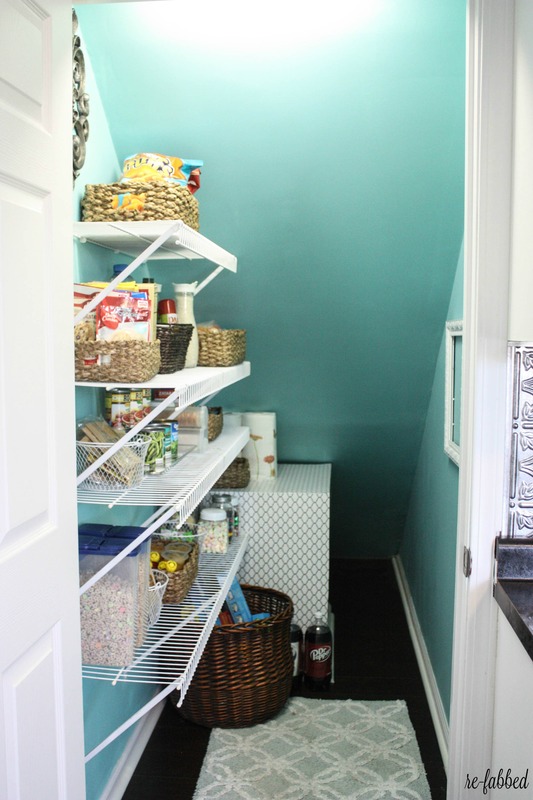 I have been working on organizing my pantry (the “fruit room” in the basement) and when a friend saw it she told me it looked like a small grocery store – high praise!!! It does mean that I have to put all the groceries away as hubby has a tendency to put something where there is space, not necessarily with its mates, but I know at a glance what I need to get at the grocery store. Living in the country, I need lots of space for food storage because a trip to the big grocery story is a 150 mile round trip! 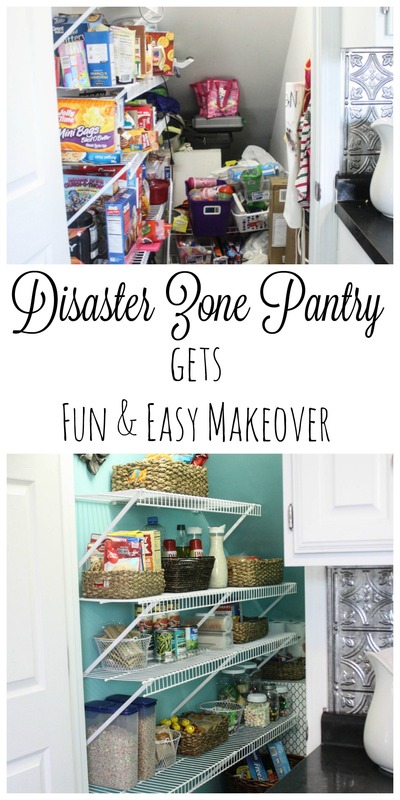 Now, your pantry is a great deal prettier than mine is, to be sure!!! I love it Brooke! You did a great job. Lovely! The color and decor that you added are beautiful. Just one tip…you might want to add some labels to those baskets so everyone else can help you keep it just as beautiful as it is today. It’s crazy how that one little detail can help maintain all the work you put into this space. Great job! Wow Brooke! The pantry looks awesome! Great job with getting it all organized and pretty! Love the color you picked for the paint. So lively! Wow, the difference is night and day! 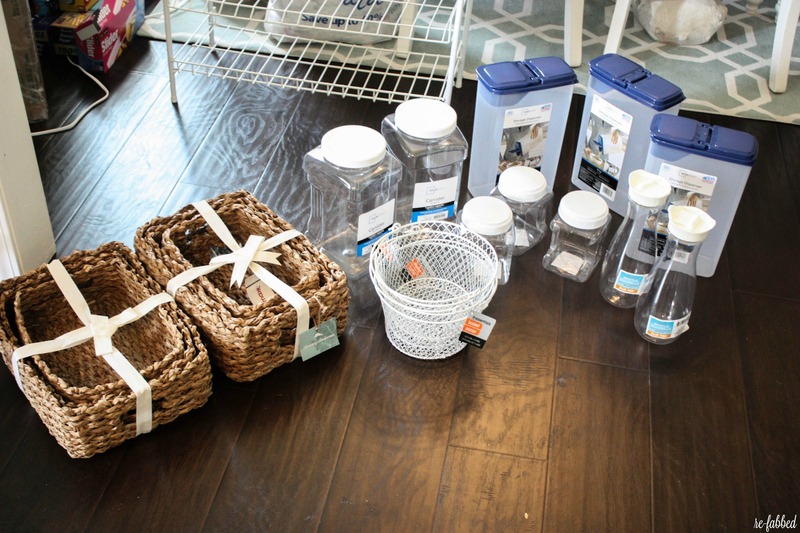 As a former professional organizer, not only do I love how you purchased baskets and containers to find a home for everything but I love how you made the space a happy and pretty space to enter! 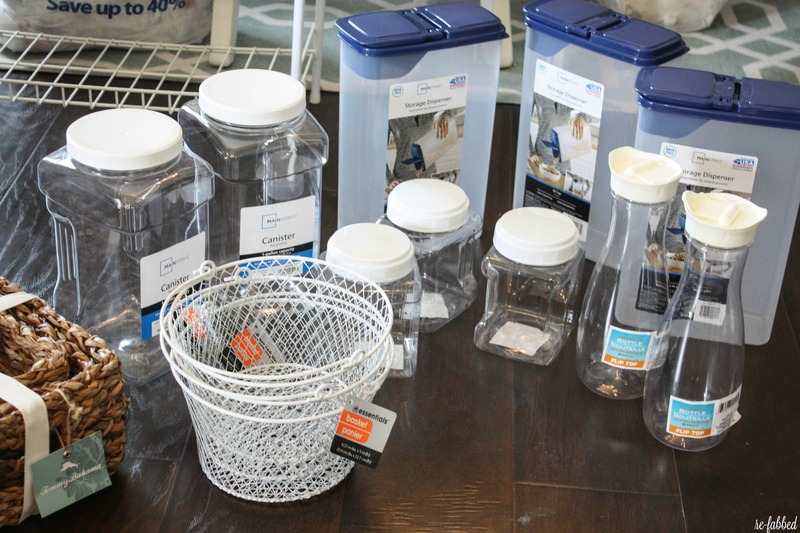 Who wouldn’t want to keep something that pretty not organized – good strategy! Great transformation! I’m sure your time in there (multiple times a day) is more enjoyable. Visiting from Creative Ways party.